It's a refrain throughout my work: we are suffering from an amnesia of sorts, whereby we seem to have forgotten much of the history of technology. As such, we now tell these stories about the past, present, and future whereby all innovations emerge from Silicon Valley, all innovations are recent innovations, and there is no force for change other than entrepreneurial genius and/or the inevitability of "disruptive innovation." This amnesia seeps from technology into education and education technology. The rich and fascinating past of education is forgotten and erased in an attempt to tell a story about the future of education that emphasizes products not processes, the private not the public, "skills" not inquiry. The future of education technology therefore is the story of Silicon Valley and a handful of elite private universities because the history of education technology has always been the story of Silicon Valley and a handful of elite private universities. Or so the story goes. I've been working on a book for a while now called Teaching Machines that explores the history of education technology in the twentieth century. And this year I've started a series on my blog, Hack Education, that also documents some of this lost or forgotten history. (I've looked at the origins of multiple choice tests and multiple choice testing machines, the parallels between the "Draw Me" ads and for-profit correspondence schools of the 1920s and today's MOOCs, and the development of one of my personal favorite pieces of ed-tech, the Speak & Spell.) See, I'm exhausted by the claims by the latest batch of Silicon Valley ed-tech entrepreneurs and their investors that ed-tech is "new" and that education -- I'm quoting from the New York Times here -- "is one of the last industries to be touched by Internet technology." Again, this is a powerful and purposeful re-telling and revising of history designed to shape the direction of the future. Of course, these revisionist narratives shouldn't really surprise us. We always tell stories of our past in order to situate ourselves in the present and guide ourselves into the future. But that means these stories about education and education technology -- past, present, future -- really matter. I'm particularly interested in "the history of the future of education," or as what Matt Novak calls his blog, the "paleofuture." 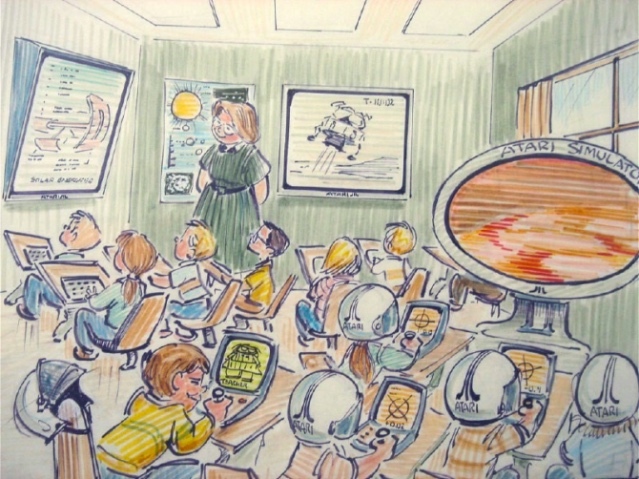 How have we imagined the future of teaching and learning in the past? 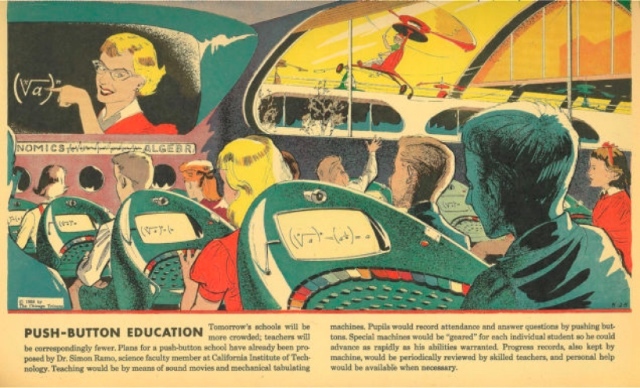 What can we learn by looking at the history of predictions about the future, in our case about the future of education? Whose imagination, what ideologies do these futures reflect? How do these fantasies shape the facts, the future? This is perhaps one of the most cited examples of the "paleofuture" of education technology. 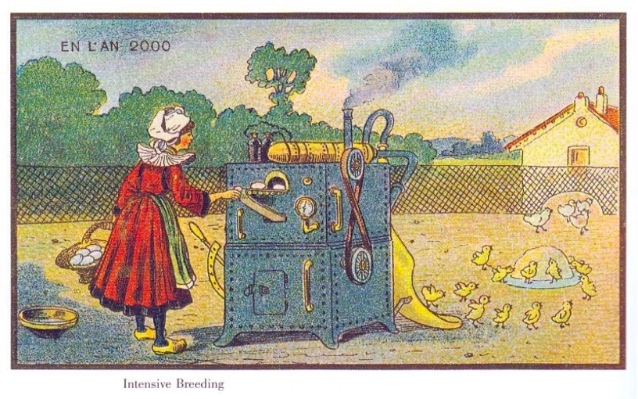 This 1910 print is by the French artist Villemard and was part of a series "En l'an 2000" ("In the Year 2000") from around the World's Fair and the new century that was packaged in cigar and cigarette boxes. Here we see the teacher stuffing textbooks -- L'Histoire de France -- into a machine, where the knowledge is ostensibly ground up and delivered electronically into the heads of students. Arguably this image is so frequently cited because it confirms some of our beliefs and suspicions (our worst suspicions) about the future of education: that it's destined to become mechanized, automated and that it's designed based on a belief that knowledge -- educational content -- is something to be delivered. Students' heads are something to be filled. The other prints in this series are pretty revealing as well. 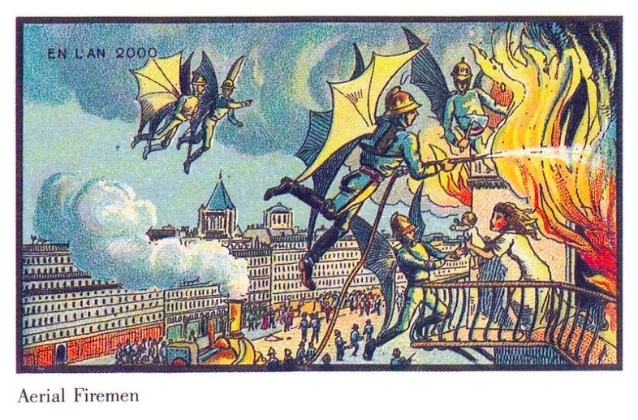 I’m fond of the flying firefighters. In these images, we see the future imagined as humans conquering the sky and the sea, as more and more labor is done by machine. 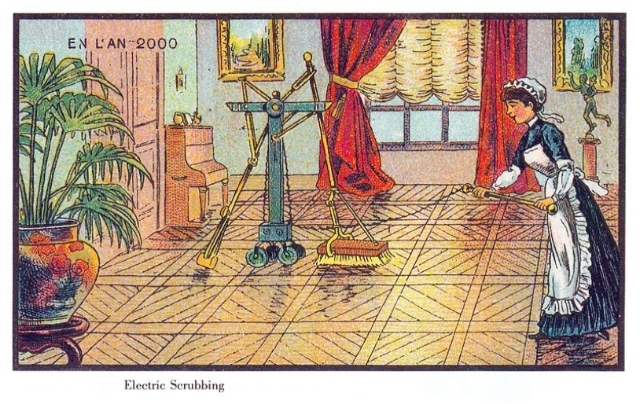 It's worth noting that quite often (but not always) the labor we imagine being replaced by machine is the labor that society does not value highly. It's menial labor. It's emotional labor. 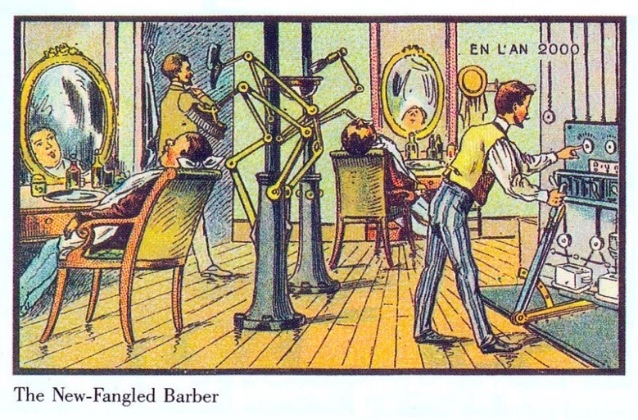 The barber. The housekeeper. The farm girl. 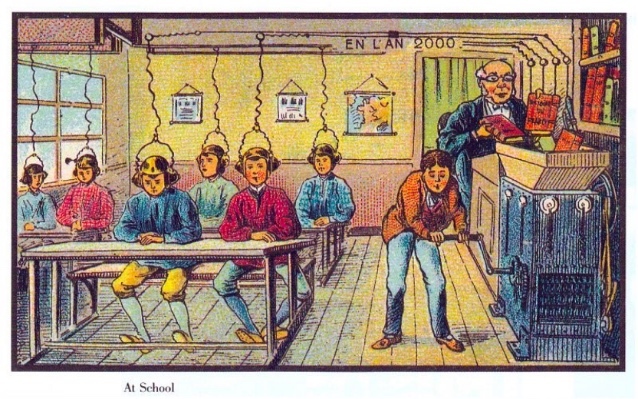 So it's interesting, don't you think, when we see these pictures and predictions that suggest that more and more teaching will be done by machine. Do we value the labor of teaching? And also: do we value the labor of learning? Thomas Edison famously predicted in 1913 that "Books will soon be obsolete in schools" - but not because books were to be ground up by a knowledge mill. Rather, Edison believed that one of the technological inventions he was involved with and invested in - the motion picture - would displace both textbooks and teachers alike. "I believe that the motion picture is destined to revolutionize our educational system and that in a few years it will supplant largely, if not entirely, the use of textbooks," Edison asserted in 1922. "I should say that on the average we get about two percent efficiency out of schoolbooks as they are written today. The education of the future, as I see it, will be conducted through the medium of the motion picture… where it should be possible to obtain one hundred percent efficiency." 100% efficiency. Efficiency. What does that even mean? Because unexamined, this prediction, this goal for education has become an undercurrent of so many predictions about the future of teaching and learning as enhanced by technology. Efficiency. It gets to the heart of that Villemard print too: this question of how we get the knowledge of the book or the instructor into all students' brains as quickly and cheaply as possible. The future: cheaper and faster. More mechanized. More technological. This is the history of education technology throughout the twentieth century. It is the history of the future of education. Radio. Radio Books. 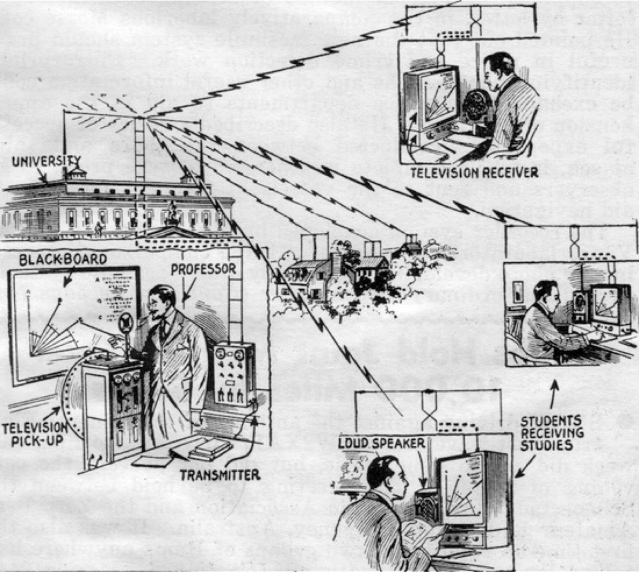 Lectures via television (This image is from 1935). Professor as transmitter. Students as receivers. 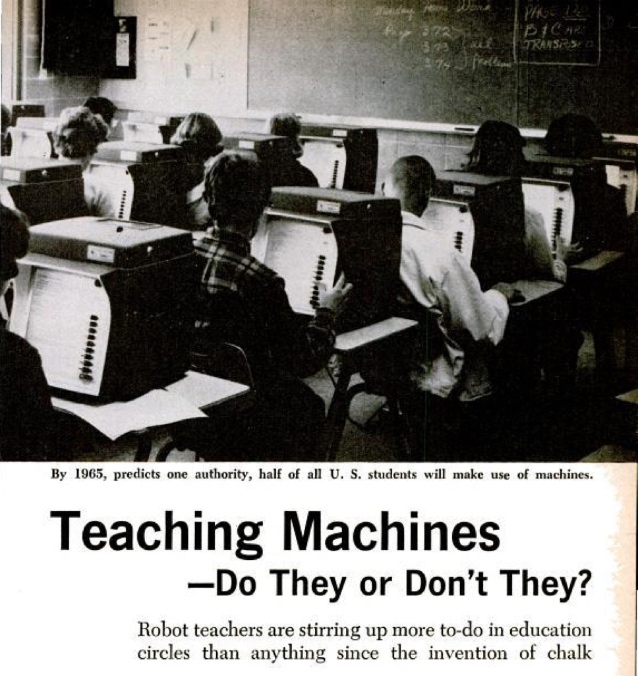 From Popular Science in 1961, a prediction that by 1965, half of all students will use teaching machines. 1981. 2015. A very similar fantasy of the future. I didn’t have this book growing up, but my brother had something similar: The Kids’ Whole Future Catalog, published in 1982. 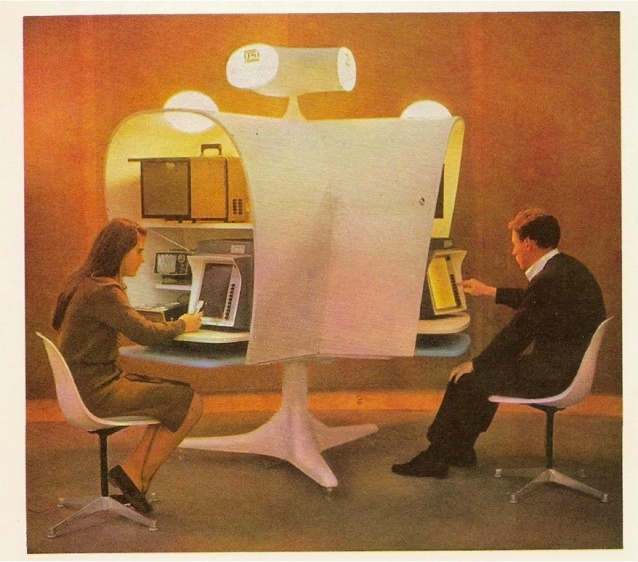 We spent hours pouring over its pages, imagining what our “whole future” would entail. Flying cars and moon colonies. Education is, quite arguably, caught in a difficult position when it comes to these sorts of predictions about the future – and it’s a position that makes education seem intransigent. See, education is – almost necessarily as we have the system constructed today – trapped by being both backwards-facing and forwards-facing. That is, education institutions are tasks with introducing students to domains of knowledge – all of which have history, a past – all the while are tasked too with preparing students for the future – a future in which, according to some stories at least, knowledge is still unknown and undiscovered. As such, there is this inevitable panic and an inevitable tension about education, knowledge, conservation, and innovation. 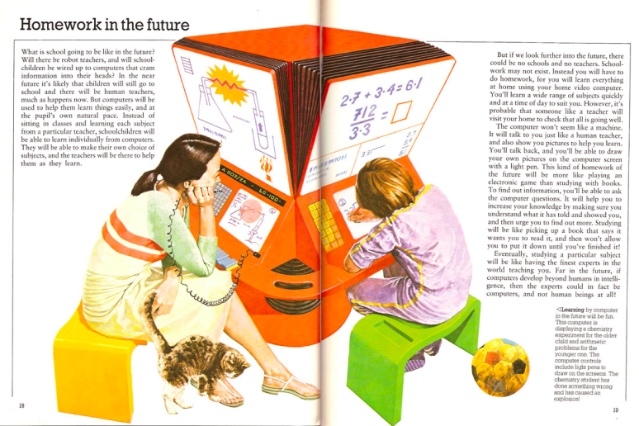 This image from 1982 was part of a series about the future of computers commissioned by Alan Kay when he went to work for Atari. 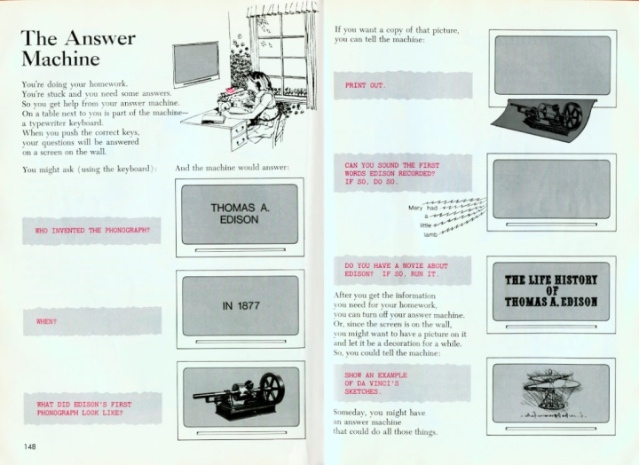 Here we see some of the earliest visions from Silicon Valley of the personal computer in the classroom. The future of education here is technological. It is branded. It is game-based. There are still desks in rows and clusters. And students still rebel. When we look back at all these predictions from the past about the future of education – the history of the future of ed-tech– the point (my point) isn’t that our education systems are reluctant to change. My point is not that schools have failed to fulfill the sci fi imagination. Indeed, I’d argue that schools have changed a lot over the last hundred years thanks to the law, not to technology: mandates for desegregation for example that would not have come from “code.” My point is that the imagination about the future is so very intertwined in our notions of the past and the present. And if we let Silicon Valley, for example, erase the history of education technology, if we allow Silicon Valley to dictate the present terms for education technology, then we are stuck with its future, its corporate, libertarian vision. 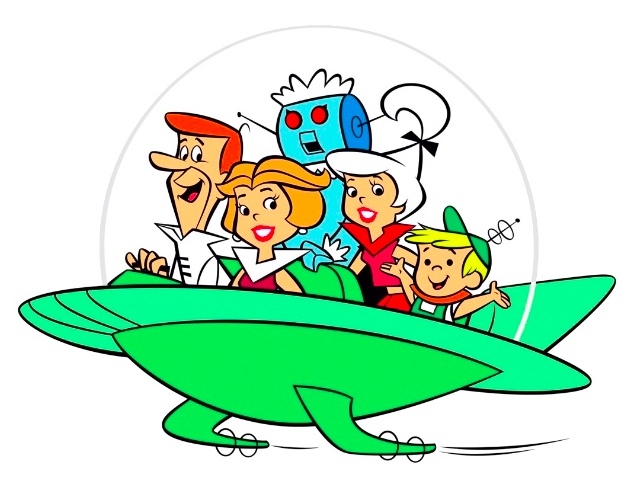 The same could be said, of course, of the imaginations of other powerful institutions: Hollywood’s vision of the future, Hanna Barbera’s, Harvard's. All the visions of the future of education, the future of teaching, the future of work, the future of learning are ideological. They are also political. As we hear the visions of politicians and entrepreneurs, as we listen to the visions of the rest of today’s speakers, we need to remember that. Predictions about the future are not neutral. They are not objective. They are invested. Invested in a past and a present and a future. Invested in a certain view of what learning looks like now, what it has looked like before and what – thanks to whatever happens in the future – what it might look like going forward.